Ruffian Games are an experienced console developer based in Dundee, Scotland. it’s great to branch out and work with a new partner like Paradox. We’re all massive fans of PS4, and releasing a game on Sony’s platform is an added bonus that is hugely exciting for Ruffian’s Hollowpoint team. 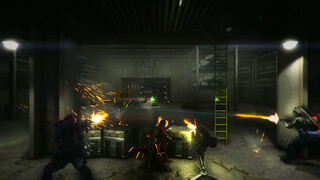 Hollowpoint is a highly tactical, four player co-operative action game featuring a blend of fast paced 2D platform shooter gameplay – directional aiming – with precision based 3D shooter gameplay – pin point reticle aiming. The goal is to build the most feared and respected Organization there is. Organizations are made up of skilled Operatives – the Mercenaries of the 22nd Century – and all of the different types of Ability, Weapons, Equipment, and Powerups they need to complete their Missions. In this world, the Mega Corporations are engaged in relentless corporate warfare – hiring Organizations like yours to do their bidding. Take on Missions to earn XP and Credits – both of which are essential to improve your Organization. You can go it alone on these Missions, but in order to complete the most dangerous and lucrative ones, you’ll need to team up with rival Organizations to have any chance of success. The game is built around a tight gameplay loop. Take out Enemies to earn XP to level up your Operative – which awards Skill Points that are used to Upgrade their Abilities. Operative Abilities are structured as a Tech Tree with branches focused on each different type. The Tech Tree also has a cap limit on the number of Skill Points that can be spent. The combination of both of these restrictions results in a deep upgrade system that allows you to create a squad of Archetype Operatives who are upgraded to focus on different types of Ability – giving you more tactical options during a Mission. 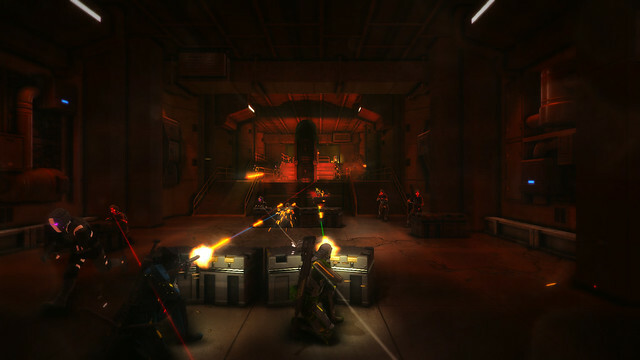 You will also earn Credits for completing Missions and for taking out Enemies. These Credits are used to buy Asset Packs from the Market – these Packs contain everything from new Operatives, Weapons, Equipment and Powerups, as well as the Upgrades that can be applied to them. Asset Packs come in various different forms, with some focused entirely on one type of Asset, with others being a mix. The more Credits you spend on a Pack the more likely you are to get more valuable Assets to apply to your Organization. 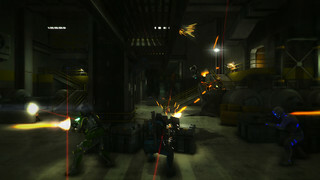 The Environments you fight in are procedurally generated and the Missions chosen dynamically during play. So while you are engaged in the gameplay loop, you are constantly experiencing new environment layouts, and new objective combinations, so that the game constantly feels fresh and varied. Already the game is looking good and playing really well. The combination of the fast paced, instant aiming of the 2D gameplay and the more skill based precision aiming in the 3D gameplay feels really new and interesting to us. It’s not something we can remember playing in anything else, giving it that lovely sense of uniqueness with the added comfort of familiarity. 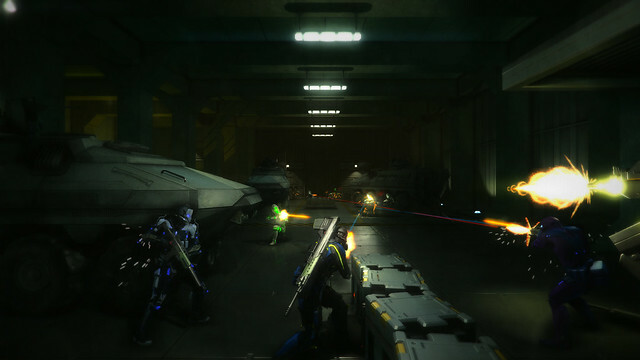 Then, you add the tactical element of the gameplay creating a game that allows you to play it in different ways based on the Skills, Abilities, Weapons and Equipment that your current Operative has at their disposal. On top of that if they don’t have the right assets to get the job done, you can switch to another of your Operatives on your Squad, or let one of your Teammates do it while you provide cover. The tactical choices are up to you to make for each Objective you are asked to complete. We’re loving working on and playing the game right now, so we’re obviously really excited about getting it finished and released to see what the public makes of it too. Awesome! The Crackdown 2 devs on PS4? SWEET! Also, this sounds like a PSX game, and I mean that as a compliment! It’s the game world – we’ve seen so many pastiches of Starship Troopers and Aliens over the past generation (SO MUCH MILITARISTIC SCI FI), that it’s just been awhile since we’ve seen a sci-fi universe like this… to me, not since the PSX/early years of PS2. I mean, we’re getting back to “Mega Corporations”, y’know? That’s generally something devs haven’t really used since the days of One, Syndicate Wars, and Project Eden! It’s a very welcome aesthetic choice nowadays! Saw the trailer on Youtube and it looks fantastic! It’s gotta be super fun, especially with friends! I cannot wait! Woo! Oh, and… I have to ask. Do you guys still have that Streets of Rage pitch you made for Sega awhile back? Can you talk about it? Well, even if you can’t, I always wanted to know why you didn’t then take it to Eidos/Square Enix instead? Maybe you could’ve turned it into a Fighting Force instead… just like back in the day, when Core Design took their pitch for a 3D Streets of Rage to Sega, and they turned it down. 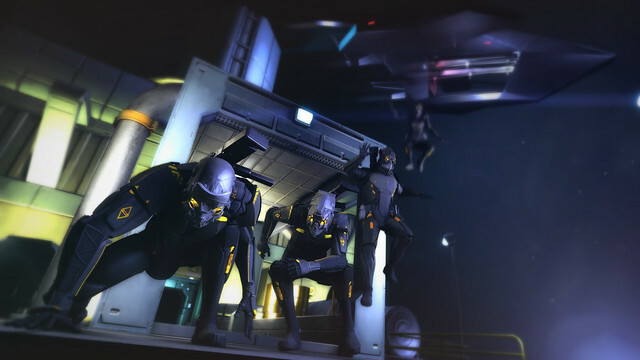 They just took it to Eidos, turned it into Fighting Force, and voila! pinpoint reticle aiming? does that mean Move support!? This looks lovely and fun. Looks a lot like level 2 of the original Contra on the NES. I’m on board with that. This game looks fun…..but it is not online only is it?